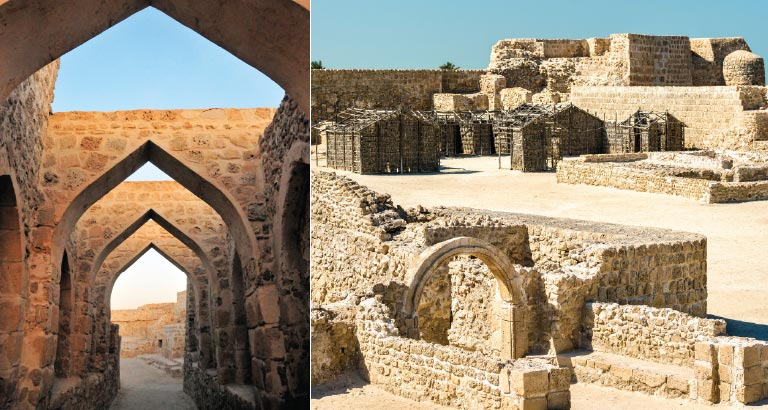 The first in a series introducing Bahrain’s rich heritage and must-visit sites. Scattered on the ruins of history, Qal’at al-Bahrain stands atop an artificial mound. It was once known as the capital of the Dilmun civilisation, during the Bronze Age. Since its inception, it has been home to a plethora of diverse cultures from the Babylonian settlers, known as Kassites, to the Assyrian people. It was equally distinguished by the presence of the Portuguese. By the early 15th century, the Kingdom was an invaluable trading El Dorado. The strategic and geopolitical advantages of the fort were key in the monopolisation of trade. Within the sights of Europe, Africa and India, the occupants of Qal’at al-Bahrain could defend their interests on all fronts. The mysticism surrounding the fort has been present since the beginning of time. As per the Epic of Gilgamesh, an epic poem from ancient Mesopotamia, Qal’at al-Bahrain represented immortality and was the ancestral home of the Sumerians. Therein lies its charm, the remnants of lost history, be it in the form of numerous vessels or artefacts. These vessels came from Mesopotamia, now modern-day Iraq, Iran, Syria and Turkey. Located on the northern coast of the Kingdom, away from the overwhelming urbanisation, the fort guards its relics of a bygone era. Encircled by palm groves, it was once the foundation for agricultural trading in the region. Within the walls is a madbasa, an element in architecture which was key to producing date syrup. It is one of the oldest in the world, reminiscent of ancient innovation. The site reflects the ingenuity of the Dilmun civilisation and its successors during both the Tylos and the Islamic periods. What was once the most important harbour in the Dilmun civilisation is left in the form of a small water channel. In times past, it conjoined agriculture with maritime trade. Adjacent to the scenic seaside, there resides what is thought to be a sea tower. Unique in its defensive structure, it is safe to assume that once upon a time, it was a force to be reckoned with. Abandoned in the 17th century, this significant archeological site was later excavated following its rediscovery in 1954 and its restoration in 1987. It was designated a UNESCO World Heritage Site in 2005. Now a museum, it is one of the most visited sites in the Kingdom. There are many exhibition halls organised to accommodate the 500 artefacts. Reiterating the numerous acquisitions since the start of the excavation, the museum introduces the five various historical periods. These are arranged to reflect the chronology of ancient glory. Visitors are offered an audio-guided tour in three languages: Arabic, French or English. Opening hours are 8am to 8pm Tuesday to Sunday. It is closed on Mondays.